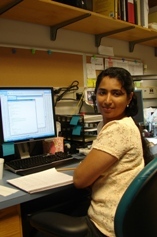 Viji came to the United States after finishing her Master’s degree in Botany from the University of Kerala, India. Once here, she decided to pursue further studies and she chose to be part of exciting and growing field of Bioinformatics. As part of her masters degree she did a project with the Burmeister Lab at University of Michigan. There she was responsible for the microarray analysis of mouse data studying the cause of ataxia. This gave her an opportunity to gain hands-on experience with the informatics area of bioinformatics. She earned her Professional Master’s degree in Bioinformatics from Eastern Michigan University, Michigan and joined Dr. Kretzler’s Personalized Molecular Medicine in Nephrology lab in the spring of 2007. Currently she works with microarray analysis starting from the normalization process to the pathway mapping with Felix Eichinger and Celine Berthier. She is also involved with the genome wide association studies.